Can you ID the unknowns by photo? This green/yellow walkeri thing I don't get. There seems to be quite a variation in these, but the "green" ones also have green wing veination, the yellows have yellow/ochre veination. Quite pronounced, but doesn't seem to be much difference outside of that. They were on the same trees. Could it be a maturity thing? They sure don't look like they just came out of the shell. Ok, The small one all the way to the right is Tibicen aurifera. Can you tell me if there is a thick black stripe on the abdomen ventrally? There is a variation to this species. 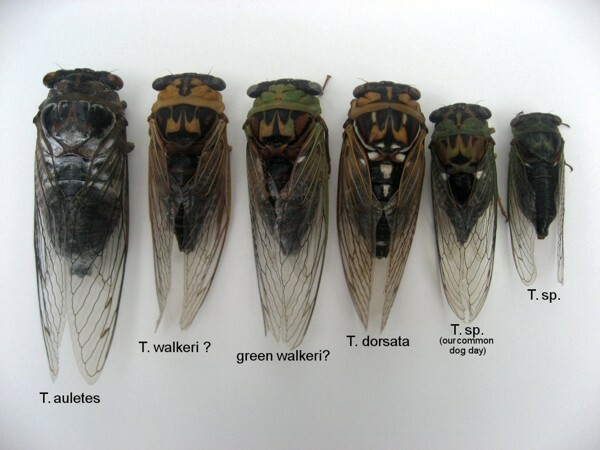 Second from the right is Tibicen pruinosa or it could be one of the sub-species T. winemmanna or T. latisfasciata. I will need to research distribution of the sub-species to know for sure. I won't be able to tell for sure until I receive them as there are subtle variations between all three. With regards to the Walkeri's, those look like T. walkeri and T. walkeri var. pronotalis the yellow one is this variation. I won't be able to know for sure till I discuss this with my colleagues. In addition I have been reading that the T. walkeri name has been changed to "T. marginalis" again, I am going to need varification on this. I saw the T.sp. 'common dog day' species this past weekend in Novi, Michigan.